This is going well isn’t it? Once again, good intentions get smashed on the rocks of reality. There has been a big change in my life since I last posted. It’s a good (a very good) change. But it’s taking some time to get used to. More anon. In the meantime, here’s a transcript of a thing I hand-wrote a couple of years ago. I’ve edited the punctuation in places, but the words are in their raw state. Nothing. The dead cannot miss anything. Missing is for the living. Ideas swelling out of my mind, growing, being shared, shaped, transformed. Birds – songs and feathers and antics. Daffodils blowing in the breeze. The memory of past events. The scent of a bonfire, the crackle and hiss of burning wood. Cold water to drink and paddle in. Water from taps, salty sea water. The beach, shells, pebbles, tidal sounds. The cry of seagulls, the smell of seaweed. Food. Biscuits. Butter. Meat. Cheese. Apples. Cherries. Chocolate. Toasted bacon sandwiches. Many things that I miss already because they make me feel ill: Gin and tonic, Campari and soda, beer, Guinness, cold white wine, Fleurie. People, cats, some dogs. Trees and old stone buildings, overgrown churchyards, petrichor. Libraries, walking, elderflowers, the smell of night air. Wind and rain and the taste of salt-spray on my lips. Cool cotton sheets and seeing the moon, especially when it’s at its slimmest brightest crescent phase. Rich winter afternoon light. Writing on a quiet night when the only sounds are my pen on the paper and the wind rustling the bamboo in the garden. Sowing seeds, making cuttings, picking the fruits of my labour (and eating them). A few TV programmes, my collections of found objects. And the collecting of them. Apple blossom and the unfurling of new leaves in spring. The end of summer and promise of cold nights and easier sleep. Ice cream. Even though I haven’t eaten ice cream for years. And fudge. Gran’s fudge. Christmas cake. Roast potatoes. Bees and spiders. Breathing. Memory – the treasure box that is past experience. The texture of things – the sensual pleasure of touching velvet, well worn cotton, cool stone, or sun-warmed stone. Polly’s fur, smooth wood, rough bark. The differences of similar things – tree barks, leaves, flowers, people. Looking at art, being in wild places. I still treasure the memory of sitting at the kitchen table that quiet evening, inking my thoughts onto paper and being pleased with the result. It’s cheering to contemplate some of the many things that make life pleasurable. I suppose it’s a law of blogging that the longer it is since your last post the more difficult it is to write another. Having composed at least three thousand “not quite witty and erudite enough” pieces in my mind, agonised over whether to start a new blog (impossible to decide on a name) and procrastinated in every way I can think of, I’m finally taking my own oft-given advice and just doing it. The sprouting oak leaves in this picture are what finally gave me the kick up the arse I needed to get going again. They reminded me that life persists even in the most inauspicious circumstances. Those tiny leaves are all that remain of a big dream, but in a way they mean more to me than achieving the original goal might have done. Last night while I was looking at some lovely and very expensive Christmas garlands in a magazine it occurred to me that perhaps I could use some of the tired old hop vine stems in my garden to make the foundation for a home-made wreath. This afternoon, with uncharacteristic speed, I put thought into action. Goodness me, it was such a pleasure! The hops are rather manky-looking, but still pliable enough to work with. As I pulled the stems free of the apple tree the crushed flowers released a delicious brewery-scent into the damp autumnal air. I twisted the strands into a loose rope, then twisted that into a circle using the plant pot as a form. It all came together beautifully, which I hope is a good omen. My plan is to leave the circlet on the pot until it is fully dry, hoping it will keep its shape. When it’s ready I’ll have a think about how to decorate it. Perhaps I’ll wind some strands of ivy round it, or attach pine cones and bows, or go for tinsel and glitter. Add bright colours or keep to natural tones? What about fairy lights? We’ll see. Maybe it’ll just sit there in the shed, another addition to my catalogue of unfinished projects. But whether I finish the wreath or not, the memory of the fun I had starting it this afternoon will remain a treasure. When Concretemoomin mentioned #DrawingAugust a few weeks ago, I thought it would be a good opportunity to a) restart my drawing practise, b) thoroughly test my new occupational varifocals and c) have another go at that “little and often” thing I’m so bad at. 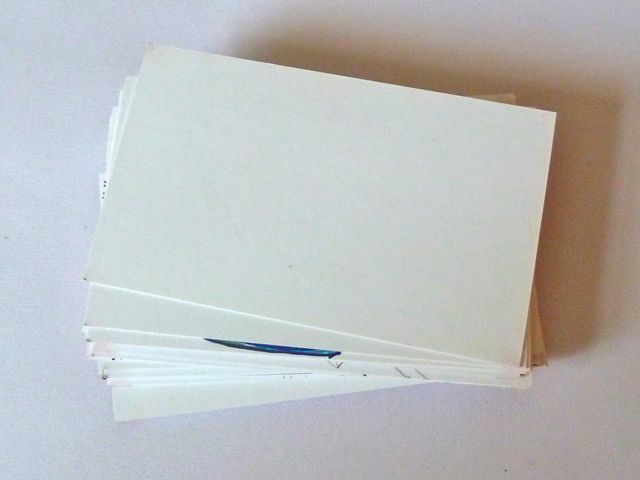 To keep it simple, I counted out 31 of the old business cards that Alison very kindly gave me a couple of years ago, put them in a box and resolved to draw something on one of them each day throughout August. Having done the day’s drawing I put the card at the bottom of the pile and didn’t look at any of them again until I’d finished the last one. On the 30th, I realised I’d have to add another card to keep day 1 hidden until after I’d done day 31! Given that the calm holiday-ish August I had planned turned out to be a bit of a one-thing-after-another stress-fest, I’m very pleased that I did do a drawing of some sort every single day throughout the month. None of them took very long – I always drew in the evening, so was often very tired by the time I started. Trying to observe rather than judge what I was doing, some days I found myself relaxed and engaged in the exercise, other times I was more like a reluctant schoolchild half-heartedly going through the motions of doing homework. As the end of the month approached I started to feel a thrill of anticipation at the prospect of reviewing what I’d done and pleasure at having persisted despite all the stresses thrown in my path. I resisted the temptation to sneak-peek, which added to my small feeling of triumph yesterday when I slipped drawing 31 onto the bottom of the pile. 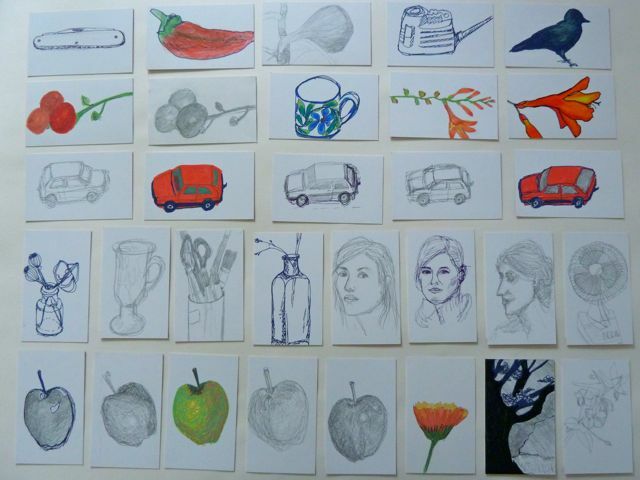 I pretty much hated all the drawings at the time of execution, whether or not I’d enjoyed making them. Looking at them again now, I still think they are crap, but, y’know, I was utterly whacked most of the time and hadn’t done any drawing for months. Many days it was just an exercise in sheer bloody-mindedness to pick up a pen and scribble. But it was fun doing the reveal yesterday, surprising myself with the subjects I’d forgotten, smiling wryly at how hard I’d tried to nail that blasted toy car and how spectacularly I’d failed at it. Perhaps the the best outcome of the challenge was the unexpected effect of deciding not to look at what I’d done until the end of the month. Each day I just did that day’s drawing, starting fresh without any feeling that I had to improve on the previous day or fear that I would do worse. And that was surprisingly liberating. Note: The image shows the drawings in random order, because I didn’t stick to one orientation so laying them out in date order looked messy. (You can listen to the podcast by Michael Nobbs that started the ball rolling here). Like Michael, I sometimes have a minimal picnic of a snack and a mug of tea made from a flask of boiling water in the car. For more adventurous outdoor eating you could buy a bucket barbecue and cook a snack on it, either out in the countryside, on the beach or just in your back garden. Thanks to Colour it Green for that idea. Or perhaps a Kelly Kettle with cooking accessories would be more useful and easier to carry. A portable gas stove is heavier, but quicker and perhaps safer for garden-cooking or car-based adventures. If possible, practise outdoor cooking/tea-making in your garden before trying it out in the “wild”. Keep things very simple. E.g. for breakfast outdoors just make a bacon or fried egg roll to eat with some fresh tomatoes. You could probably gently heat up sausage rolls in a frying pan – minimal preparation required, but fun to eat in the open air. When we were teens my brother and I used to go to a place where the local river ran through a small wood and make a small fire on the gravelly bank. We’d toast cheap bread rolls from the village shop and ate them smeared with Dairylea cheese triangles. Utterly delicious – at least in memory. Obviously finding places to make campfires is more difficult nowadays, but if there’s somewhere suitable there’s really nothing to beat building a little fire to toast a bun. Have the things you need to go adventuring ready to go when you feel like it. Fill a backpack with items such as a clean flannel for drying feet after an impromptu paddle, cutlery, a bottle of water, energy bars, cooking kit, matches, tea bags and mug, wipes to clean your hands and plastic bags for waste and foraged food. Something waterproof (and padded) for sitting on is also useful. Keep a rug and a pillow in the car in case you need to bed down in it for a rest after adventuring. Always travel with plenty of water, emergency food and essential medications (don’t keep them in the car though, as they may be damaged by heat). I also keep wellies in the car and spare clothing. If funds allow and your garden is suitable, you could buy a bivvy bag and camping mat so you can sleep out in your garden on really hot nights. If you have a guest-room, sleep there occasionally. Even sleeping with your head at the foot of your own bed makes sleeping and waking a slightly different experience. Walk barefoot on the lawn in your garden or at the park at different times of day, in sunshine and shade, wet weather and dry. Sit on the grass and write down the names of all the flowers and plants that you can see in a square foot or square yard or whatever. If there’s a downpour on a warm day go out in your garden and enjoy the sensation of getting deliberately and exultantly drenched to the skin (barefoot with light clothing is best for this). Then have a quick shower or bath and a brisk rub down to warm up before getting into bed. Drink a cup of hot tea and have a good nap. Similarly, on a warm windy day, go outside and focus completely on the sensations of the wind on your skin, in your hair, ears. Listen to the noise it creates around you, think of where the particles of air and dust that you are breathing have come from. Watch the plants bending and swaying their wind-dances. If you have a regular circular walk that you always walk clockwise, try walking it anti-clockwise or vice versa. In dry, warm weather find a place to lie down for a few minutes mid-walk. Look up at the sky or down at whatever is growing or crawling beneath you. If the conditions are safe, take off your shoes and feel the ground beneath your feet. Paddle whenever you can in streams or the sea. When walking a footpath, step off it a little way to visit a rock, tree or flower that catches your eye. Collect pine cones to burn on the fire in winter. Just sitting watching a big resinous pine cone crackle and flame is an adventure and a reminder of the collecting time. When you are out walking do you things that you might done when you were a child such as climbing on a wall, a fallen tree trunk or up a tree to get a different view of your surroundings. If the way ahead is clear and safe walk backwards for a few steps, or close your eyes and see how long you can continue walking. I can walk with eyes shut fairly confidently for about ten steps, then I start to slow down and after twenty or so increasingly tentative steps I have to open my eyes. Go outside in the dark before bed to smell the night air and look at the sky, the moon, the stars. Observe how the moon lights up certain types of clouds. Watch how the tiny winking lights of an aircraft seem to move between the stars. 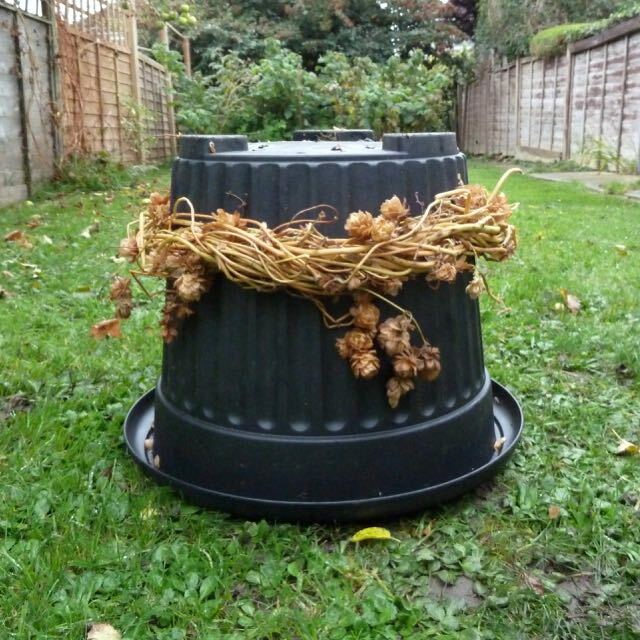 I can have an adventure just walking down to the compost bin and looking carefully to see what’s new. One morning last year I was so entranced by the sight of a yellow leaf caught in a spider’s web twirling gently in the breeze that I went and got my camera to video it. That leaf, trapped and twirled by unseen forces seemed to represent the way my life felt at that time. Like the leaf, I had to wait patiently until the wind and web let me go on my way. If you like to stop and draw when you are out and about, try making a sound sketch instead (or as an addition to your drawing). Sit quietly and listen to your surroundings. Write down everything that you hear in your sketchbook. On grim days you can do this lying on your bed at home – it will connect you with the outside world. Any deviation from your normal routines can feel like an adventure. Even such things as brushing your teeth with your non-dominant hand can be surprisingly interesting. If you always use the same car-park in town, try a different one. If there’s a different route from A to B, try taking it or simply cross the road and walk along the other side. Routines can be extremely comforting, especially in times of stress, but they can also become restricting. A rut is a rut, even if it has a velvet lining. But you don’t have to leap straight from your rut to a white water raft to have an adventure – just peer over the side and have a look around. Then set off to explore whatever catches your eye. One thing will lead to another. You can listen to Michael’s pre-recorded podcasts about his first tiny adventures starting here (click on the Daily Podcasts link to find the rest of the series). Keep listening next week to hear about what Michael has been doing whilst on holiday and his future plans. 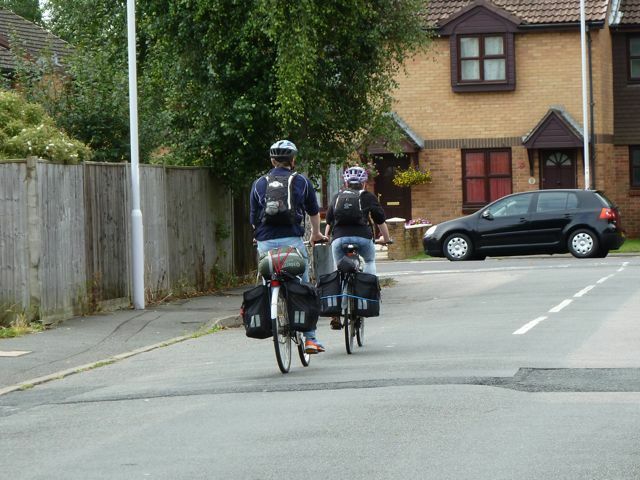 My latest adventure was having my niece and her boyfriend stay overnight as part of their rather bigger adventure of cycling a personalised version of the South Downs Way from Winchester to Eastbourne. I enjoyed their company very much, but was happy to get back into my bed after waving them off on the next stage of their journey. I’m having a low energy, high pain sort of day, but this afternoon I ventured out into the wild wind (strong breeze), braving the dangerous creatures (ants that bite) to lie on my lawn and observe my surroundings. 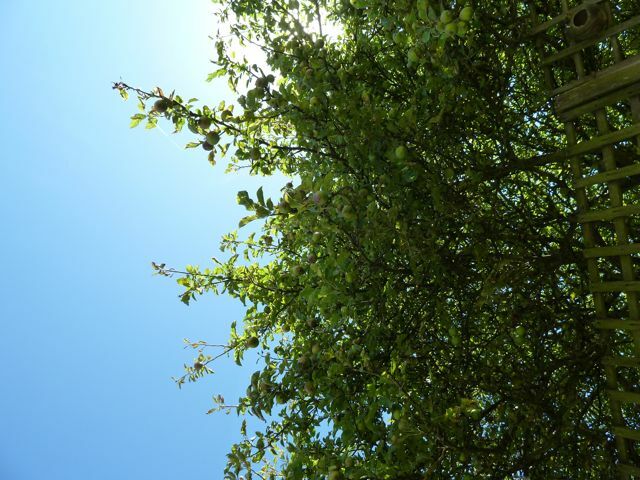 I looked up at the tips of apple tree branches swaying in the breeze. I saw scruffy leaves, shiny young apples, lichened twigs, a clump of white fluffy woolly aphids, the bright blue sky and a sparrow flitting towards the feeder. A movement high up to my left alerted me to the graceful flight of a seagull spiraling slowly downwards. Attention on the sky I saw that there were little fluffy clouds interrupting the blueness and, glinting in the sun, a jet heading towards the coast, contrail trailing. The steady roar of engines contrasted with the irregular sounds of birdsong and rustling leaves. Two pigeons swooped from somewhere behind my head towards the roof of my house and a pair of sparrows shot off in the other direction. Spooked by the pigeons? I pondered the difference between bird-flight and human-flight. Until a fast-flying bumble bee caught my attention… Why the hurry? Other bees were ambling about in the usual relaxed manner of bees foraging in sunshine. I felt the coolness of shaded grass beneath me and the delicious rush of air over my body. I tuned into the different rustles the wind made in the bamboo and the apple leaves. Noticed the pauses in sound and movement, tried to detect a pattern to the gusts. Turning my head I got a daisy’s-eye view of my surroundings. To the right, to the left. Daisies, buttercups, grass, the raised beds, shrubs, chairs, fences all odd angles, looming, reminding me of how adult-sized objects appear to a child. Turning to the right again I noticed a pair of sparrows clinging to the brickwork of the house under the eaves. I shifted up onto my elbows to get a better look. Were they prospecting for a home? No, they were pecking at something I couldn’t see. I decided they must be stealing insects from invisible spider’s webs. It’s not like exploring the Amazon, but when you have limited energy you have to make the most of what you’ve got. There’s a lot going on in a garden and many living things to keep you company when you are too weary for human interaction. 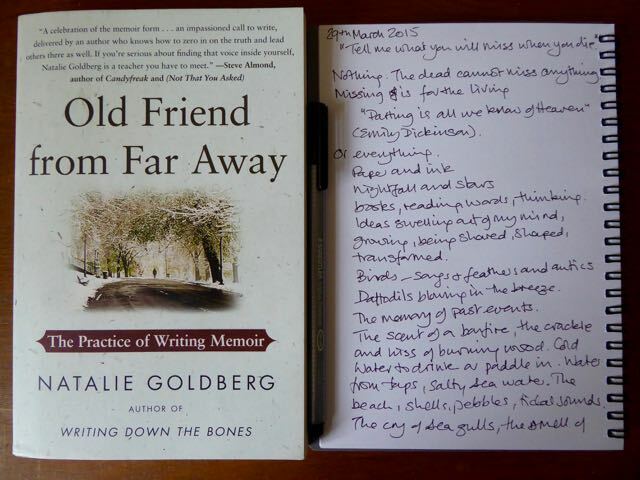 My tiny adventure refreshed and inspired me sufficiently to write this and it took even less effort than a micro walk. All you have to do is look and listen. To me the word schedule shrieks Constraint! Pressure! Restriction! Captivity! Limitation! The thought of a timetabled day fills me with claustrophobia and rebelliousness. But “a net for catching days”? That doesn’t sound too bad at all.